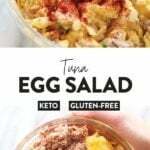 This Tuna Egg Salad blends the flavors you love from tuna salad with egg salad for a satisfying and protein-packed lunch! 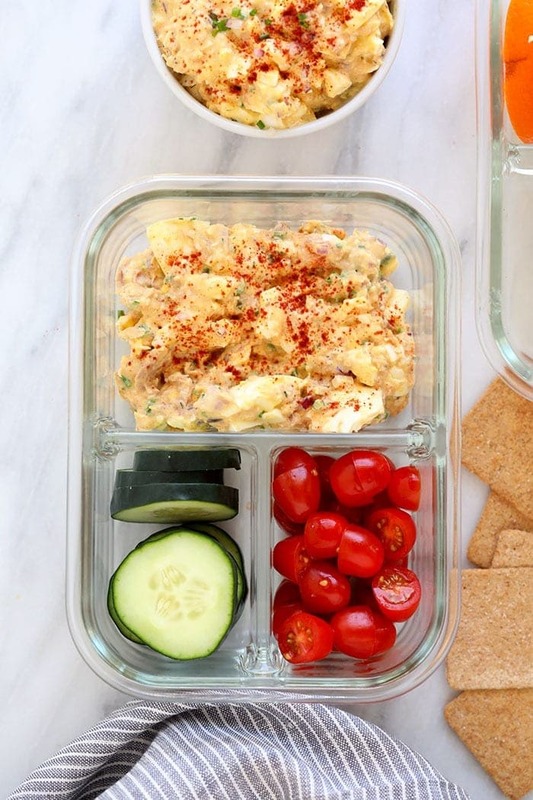 Filled with a short list of real ingredients, this tuna egg salad recipe can’t be beat. 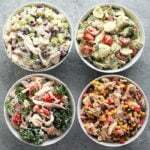 Lunch is served! 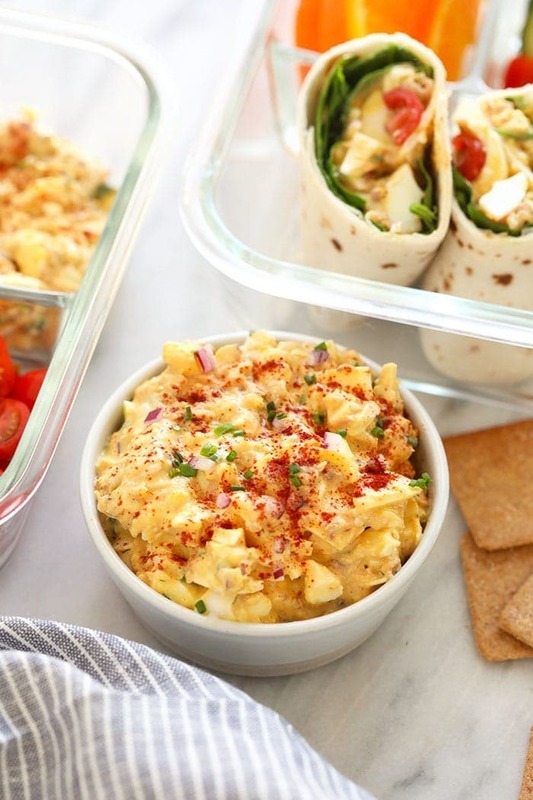 We’re new fans of tuna egg salad, and ever since we whipped up this deliciousness, we can’t stop meal prepping it for team lunches. 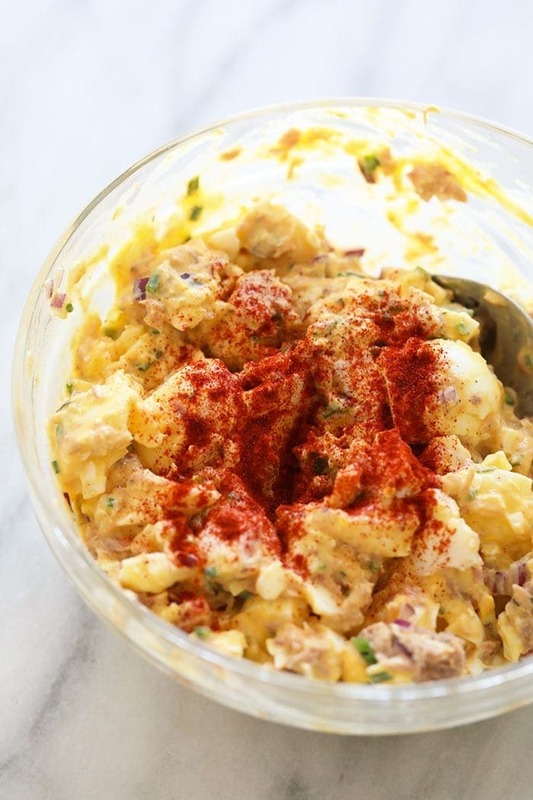 We’ve been telling people that it tastes like tuna salad and egg salad had a baby (in the best way possible). And the true test of this recipe was sharing it with my husband (Linley’s brother — did you know we’re sisters in law?! ), Bryce. He grew up eating more tuna salad than I’ll probably eat in my entire lifetime (and I love a good tuna salad). In high school, you could often find him with 2-4 tuna salad sammies packed in his back pack to keep him full throughout the day as a growing teen. 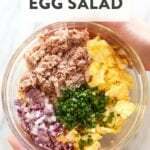 Not exactly my ideal meal on the go — not to mention, that could NOT have smelled great — but his review of this tuna egg salad was that it’s agrown-upp version of the tuna salad he loved growing up. Win! First, follow our hard boil eggs in the oven tutorial to hard boil 8 large eggs. 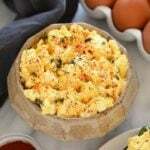 If you’ve just bought a dozen eggs specifically for this tuna egg salad, feel free to hard boil all 12 and keep 4 hard-boiled eggs on hand for breakfasts or snacks on the go throughout the week. Once the eggs are done, transfer them into an ice water bath for around 10 minutes. This makes them easier to peel. Peel all 8 eggs. 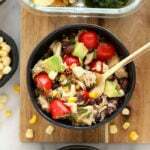 Then, chop them into small, bite-sized pieces and place them into a large bowl. Drain and rinse a 5 oz. 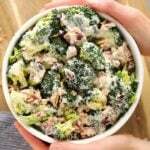 can of white albacore tuna and add that to the same bowl. 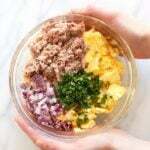 Mince 2 tablespoons of red onion and 2 tablespoons of chives and add those to the bowl and mix together. 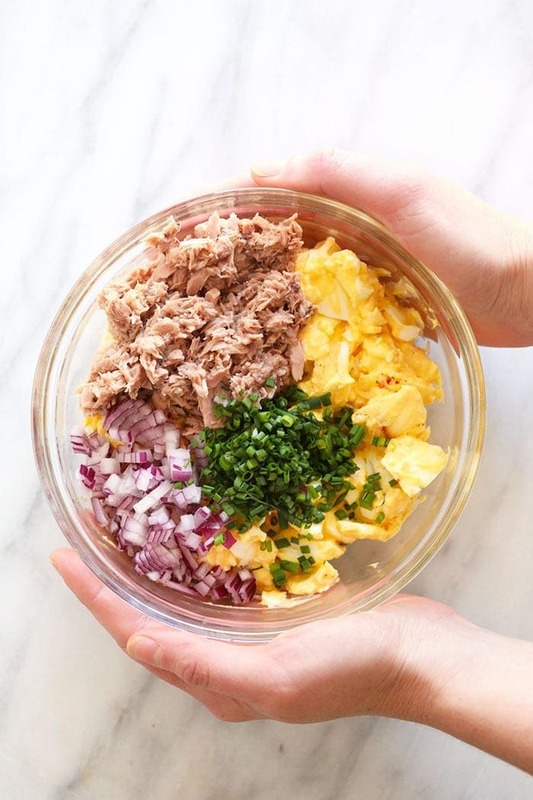 Prepare the tuna egg salad sauce by mixing together Greek yogurt, mayonnaise, dijon mustard, and sriracha in a small bowl. Then, add this sauce to the large bowl and mix everything together. Finally, season with smoked paprika and salt and pepper, to taste. 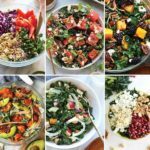 ALL salad recipes on Fit Foodie Finds. First, follow our “hard boil eggs in the oven” tutorial to hard boil 8 large eggs. Once the eggs are cooked, transfer them into an ice water bath for around 10 minutes. This makes them easier to peel. Peel all 8 eggs. Then, chop them into small, bite-sized pieces and place them into a large bowl. Mince 2 tablespoons of red onion and 2 tablespoons of chives and add those to the bowl and mix. 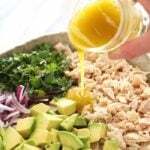 Prepare tuna egg salad sauce. 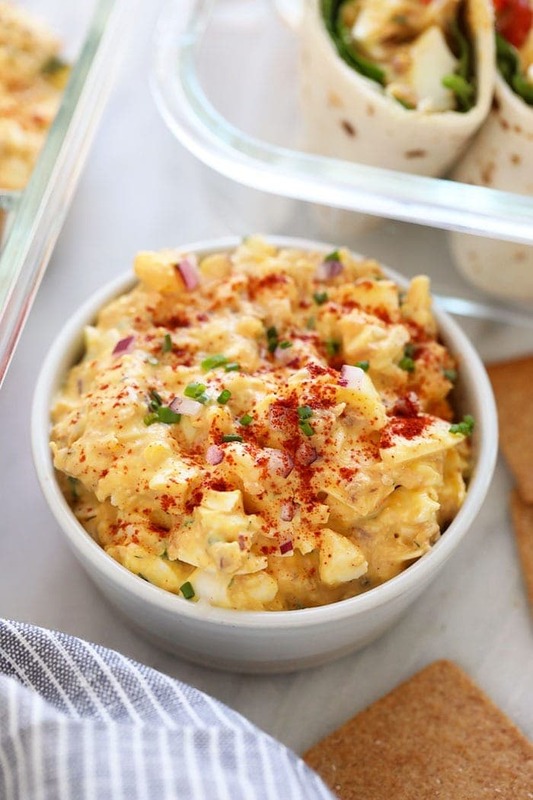 In a small bowl or Pyrex, mix together Greek yogurt, mayonnaise, dijon mustard, and sriracha. 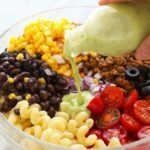 Then, add to the large bowl and mix everything together. Serve with veggies and or on a piece of toast.